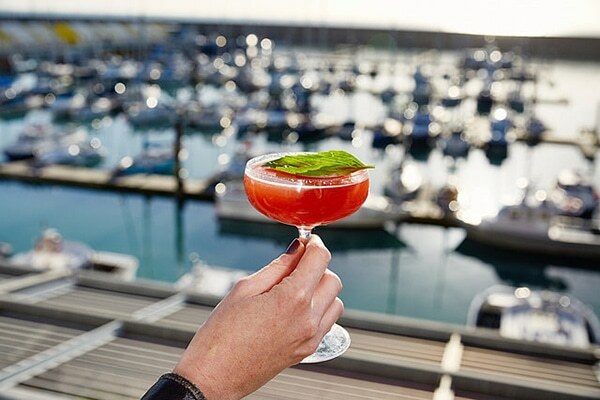 Located in prime position overlooking the picturesque marina is Malmaison Brighton, the latest addition to the thriving hotel chain. 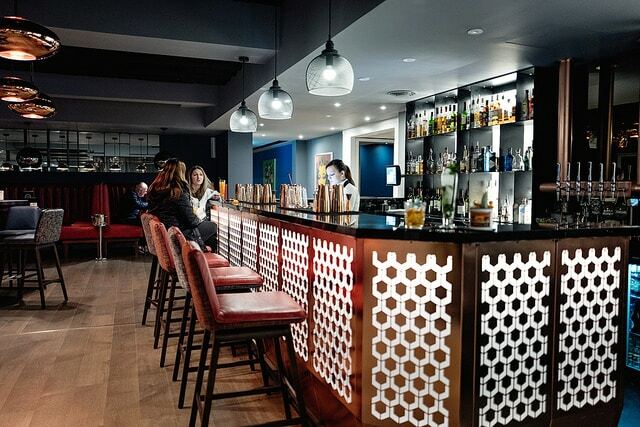 It has been completely re-styled and boasts a striking modern décor throughout. Afternoon tea is served in the Chez Mal lounge, which has a mellow, laid-back vibe and is funky and colourful with comfy seating and plump cushions galore. 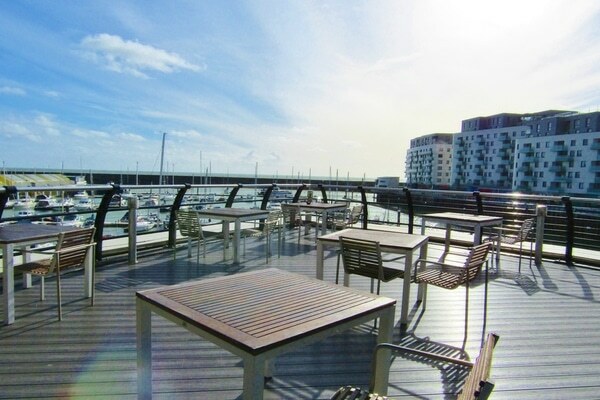 One wall is entirely glazed, providing stunning views across a prow-shaped deck to the bustling marina and shimmering sea beyond. You can enjoy a classic cream tea of scones with clotted cream and strawberry jam, sour cherry polenta cake and salted caramel brownie with your choice of specialty teas, or if you want to push the boat out, you can go for the full afternoon tea. 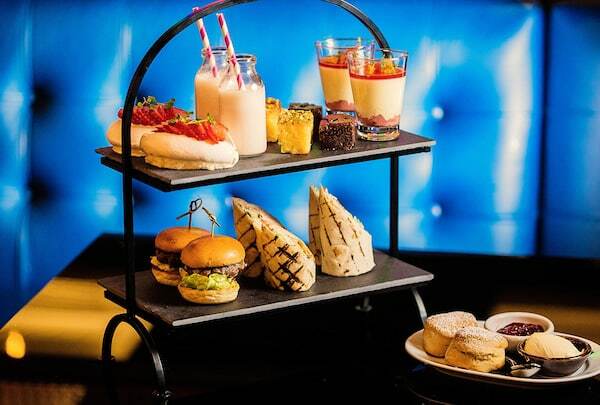 Malmaison offers a jazzed-up twist on your traditional afternoon tea, with mini-burgers and wraps followed by the requisite scones and assorted, indulgent, sweet treats. If you want to make it extra special why not add a glass of Champagne or, if you’re feeling fruity, perhaps a cocktail? We were seated on a sofa directly in front of the window, so we were able to enjoy the view in its full glory. The sun was shining, the sky was blue and the yachts of the footloose and fancy-free were gently bobbing about on the sparkling sea, it was blissful! We opted for the traditional afternoon tea and decided to get a full bottle of fizz rather than pay by the glass. We ordered a bottle of the only prosecco available, which was not cheap at £39 but it was exceedingly pleasant, light and refreshing and just the ticket for a warm spring day. Once we were comfortably installed, with our glasses of chilled bubbles glittering in the bright sunshine, we relaxed back and set to nattering. After a reasonable amount of time enjoying our drinks and soaking up the atmosphere, we were delivered a striking, two-tiered, black slate stand stacked with a veritable cornucopia of colourful goodies. It looked amazing! We started with the adorable and frankly not-so-little burgers and boy, what a start! They were absolutely delicious! The nice thick beef patty was well-seasoned and beautifully cooked so that it was a little pink in the middle and seriously juicy. The lightly toasted brioche bun was also cram-packed with impeccably fresh salad and a big slice of tangy pickled gherkin, which my friend duly ejected as evil incarnate but I positively loved. It was an exceedingly promising start and after a couple of glasses of bubbles we were beginning to get into the swing of things. Next up was the hot smoked salmon and crème fraiche wrap, which was scrumptious and a great contrast to the burger. Generous, thick chunks of meaty, delicately smoky salmon with sweet, crisp lettuce and a light, cool crème fraiche. A wonderful summery light bite. Our final savoury nibble was a chipotle chicken and avocado wrap. 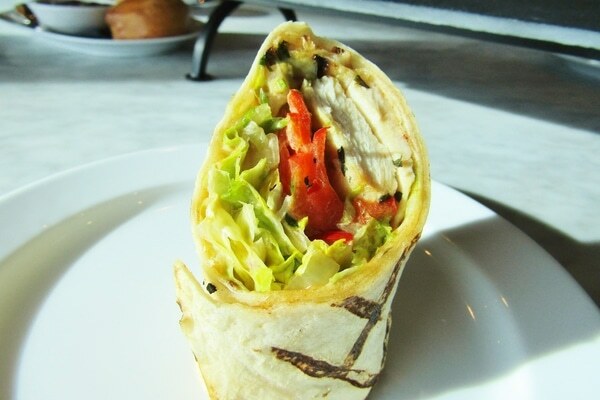 Slices of moist chicken, lettuce and crunchy vegetables and smooth, luxurious, ripe avocado in a fresh wrap with a rich, creamy, slightly fruity chipotle dressing. We were already feeling a little full and were starting to realise the magnitude of the task at handso we decided this was a good moment for a pause. We sank back into the cushions, enjoyed the warmth of the sun on our faces and washed down “the first course” with another glass of bubbles. We were just about ready to tackle the tier of sweets when the lovely waitress broadsided us with a plate of golden crumbly scones, thick indulgent clotted cream and fabulous strawberry jam. 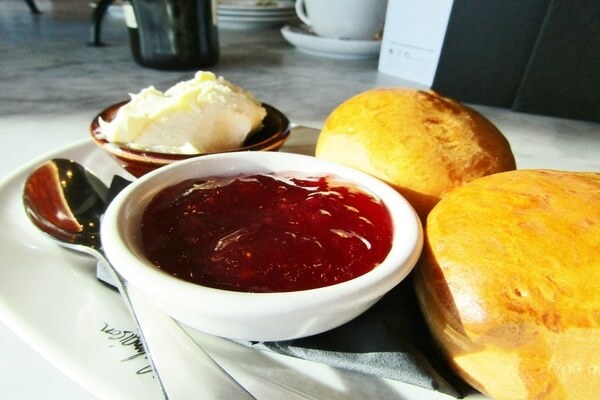 Oh well, if we must, we thought, after all, you can’t have an afternoon tea without scones. We washed them down with our vibrant pink berry smoothie, which came in a cute little bottle with a straw and was thick and fruity and tasted of summer. Next up was the salted chocolate brownie. I am not exaggerating when I say that after her first bite my friend visibly melted. Good, is it? I asked. Her eyes rolled in an omg kind of way. She wasn’t wrong, it was moist, gooey, chocolatey, salty, caramelly and positively sinful! Then, for a contrast of flavours and textures (like there was actually any kind of strategy other than ooh, that looks nice), we picked the strawberry and vanilla pavlovas. Crisp, sugary, pure white, puffy meringues filled with vanilla cream and topped with slices of juicy strawberry. Simple but delightful. So, finally, we finished with the sour cherry and polenta cake, another gorgeous, super-moist cake, sweet and sticky with a little sour zing from the juicy cherries. A fantastic finale to a momentous feast. We flopped back triumphant! It was only then that we got around to ordering our actual tea. You can choose from traditional breakfast, naturally decaffeinated breakfast, Earl Grey or afternoon Darjeeling. For a healthy boost, you can try a Green tea with jasmine or lemon. 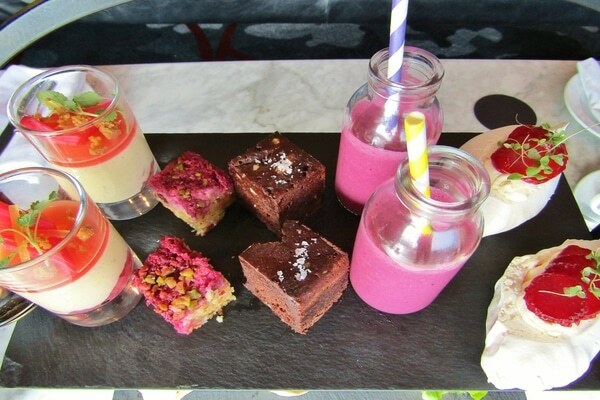 Or, if herbal and fruit infusions are your thing, there’s chamomile, peppermint, blackberry & raspberry or lemon & ginger. We both opted for traditional breakfast, which we hoped would deliver a desperately needed hit of caffeine to help prevent us falling into a bloated stupor. Service was polite and professional and provided by a team of young, enthusiastic waiting staff and whilst the prosecco was pricey the afternoon tea itself was good value. It was a lovely leisurely afternoon and by the time we were done we were surprised to discover that nearly three hours had passed! We left feeling relaxed, happy and rather fat.